WGBH's program, Greater Boston, talked with Dr. Kristine Burgess about how treating cancer in our companion animals helps inform how we treat humans. The oncology service is led by board-certified specialists in medical and radiation oncology and is supported by a team of residents, dedicated technicians and staff. We work closely with a highly skilled surgery service, with expertise in surgical oncology, as well as with specialists in internal medicine and a variety of other services. This close collaboration allows us to offer options for treatment that are tailored to the individual patient, according to the tumor type, the particular health of the patient and the family's expectations. This could be either a comprehensive treatment plan that includes a combination of different therapies or a more conservative strategy focusing on palliative care. The radiation oncology service boasts a sophisticated linear accelerator (Siemens Primus linear accelerator with 6MV photon and 6-21 MeV electron capabilities. This unit has a 56-leaf collimator that allows for intensity modulated radiation therapy). This is only one of a few such units in operation in veterinary medical establishments. Strontium plesiotherapy is also available. The Harrington Oncology Program is recognized nationally as a leader in the field. The members of the service are engaged in ongoing research into the causes, biology and treatment of cancer, including environmental risk factors for cancer and novel cancer therapies. 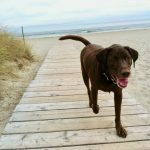 Why is Radiation Therapy Recommended for my Pet? Radiation therapy is an important tool in treating various cancers in both human and veterinary medicine. It may be recommended by your veterinarian as a sole treatment option for your pet’s cancer or often in combination with surgery, chemotherapy, and/or immunotherapy. Radiation therapy may be used alone for tumors that are inoperable due to location or size or to preserve function in a vital area. Radiation is also sometimes used before surgery to either shrink a tumor that was otherwise inoperable or to kill the cancer cells around the edge of the tumor to increase the chance of complete surgical removal of the tumor. By far the more common approach in veterinary medicine is post-operative radiation therapy. In this setting, radiation therapy is administered after surgery in cases with incomplete or “dirty” surgical margins with the goal of killing any remaining cells that could otherwise lead to tumor regrowth. For cancers that are likely to spread (metastasize) to other parts of the body, radiation may be used to best target the primary tumor while chemotherapy or immunotherapy are also used to best to target the distant disease. What Tumors are Commonly Treated with Radiation Therapy? Radiation works by damaging the DNA in cancer cells, thereby destroying the cancer’s capacity to continue to grow and divide. The effect of this radiation may not be apparent until after one or more attempts by a cancer cell to divide. Sometimes it can take weeks before a cancer cell attempts to divide, thus the benefits of radiation therapy continue to be observed days to weeks or even months after the treatments are completed. What Steps are Taken Prior to Starting Radiation Therapy? Prior to referral for radiation oncology, you pet has been diagnosed with cancer. This typically involves either a fine needle aspirate used for cytology and/or a biopsy of the tumor. The information from these tests is crucial as it informs our oncology team about the type of cancer your pet has and potentially how aggressive the tumor may be. This information also helps to guide further evaluations of your pet as well as what treatment options are appropriate for your pet. Further diagnostic tests used to evaluate the extent cancer has spread through the body as well as to assess the general health of the pet are referred to as staging tests. Common tests used in staging include bloodwork (complete blood count/CBC, chemistry profile, and others), urinalysis, lymph node aspirates, chest x-rays, and abdominal ultrasound. 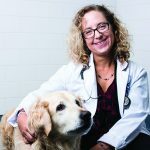 Knowing the extent of spread of cancer throughout the body helps inform prognosis and treatment options, while knowing the general health of the pet helps to inform the safety of delivering any recommended treatments. For radiation therapy, advanced imaging via a CT scan (and sometimes also an MRI) is also required. These advanced imaging techniques give the most accurate anatomical information about the tumor as well as its proximity to surrounding normal tissues and organs. As the radiation treatment is planned from these images, it is important that at the time of the CT scan your pet is positioned in the exact position he/she will be in for subsequent radiation treatments. Special mattresses are molded as a bed around your pet to aid in this positioning. External beam radiation therapy is delivered via a linear accelerator. The linear accelerator is a large piece of equipment that produces high energy x-rays (for treatment of deep seated tumors) or electron beams (for treatment of superficial tumors) that are directed at the tumor and some normal tissue around it. At Tufts we have a state-of-the-art Varian iX linear accelerator with on-board imaging to allow precise tumor localization and RapidArc technology. RapidArc is an advanced form of therapy which can deliver precisely-sculpted 3D dose distribution with a 360-degree rotation of the machine around the patient in a single or multi-arc treatment. The total dose used and the number of treatments in which the total dose is given depend on many factors including the treatment intent, type of cancer, the size and location of the cancer, and the general health of your pet. 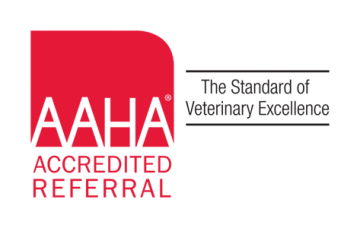 We will provide you with specifics of the recommended protocol for your pet at your consultation appointment. What is the Difference between Definitive and Palliative Radiation Therapy? The terms definitive and palliative when used in reference to radiation therapy refer to the treatment intent. Definitive-intent radiation therapy aims to maximize patient longevity and minimize late normal tissue toxicity. It is to maximize patient longevity and minimize late normal tissue toxicity. dn efer to the treatment intent. With definitive rs often recommended when given the type and extent of a patient’s cancer, life expectancy for the patient is approximately 1 year or longer. Generally speaking, definitive-intent protocols involve 15-23 daily (Monday to Friday) radiation treatments over the course of 3-5 weeks, in which a high cumulative dose of radiation is delivered via several smaller daily doses (fractions). This dosing strategy allows for normal tissues to repair between fractions to avoid serious side effects to these tissues down the road; however, short term side effects secondary to inflammation are common. By contrast, palliative-intent protocols aim primarily to alleviate clinical signs and discomfort associated with the tumor via temporary reduction in tumor growth with as limit impact as possible in terms of side effects in the short-term setting. Palliative treatments are often recommended for patients with shorter life expectancy due to advanced or metastatic tumors. The paradox in this treatment is that if we are successful in preserving quality of life and the patient lives an extended period of time, late side effects can become a problem as a consequence of the dosing strategy used in some palliative protocols. Palliative-intent protocols can range from a single up to 10 treatments, delivered daily, twice-daily or weekly. What Types of Radiation Therapy Planning are there? Manually-Planned Radiation Therapy involves the use of x-ray films to determine how to position the radiation beams and dose calculations are performed by the radiation oncologist without the assistance of computer-based treatment planning software. Planning for this therapy can be done rapidly and the patients can start treatment very quickly, as opposed to other techniques which require more in depth, advanced-imaging based planning. This type of treatment is typically reserved for tumors located in simple anatomic locations (jaw, limbs) and for urgent treatments. 3D Conformal Radiation Therapy (3D-CRT) involves the use of CT images and computer software to develop a more complex treatment plan. Use of the CT images allows the tumor and normal organs to be defined in three dimensions as opposed to only with the flat two-dimensional x-ray. For this type of therapy, a CT scan of the patient is first obtained with the patient in treatment position. The tumor and surrounding normal organs to be avoided are outlined and radiation beams are chosen to best avoid the normal tissue while delivering the target dose to the tumor. The computer can then calculate the dose received by all tissues and the beams subsequently adjusted to maximize dose to the tumor and minimize dose to normal organs. In addition to optimizing beam positions, the radiation field can be shaped with either custom-made lead-alloy blocks or via a multi-leaf collimator (lead “leaves” that move quickly and independently to form different complex shapes). Intensity Modulated Radiation Therapy (IMRT) is an even more sophisticated form of radiation therapy which capitalizes on the multi-leaf collimator and advanced 3D computer planning for beam shaping, providing the potential to spare even more of the surrounding normal tissues from radiation. Similar to 3D-CRT, the tumor and normal organs are outlined and mutliple beams are used around the patient to optimally deliver the radiation. In IMRT, however, the multiple beams are further subdivided into several smaller beamlets. Advanced computer software is then used to determine the best shape and arrangements of these beamlets. Use of these beamlets allows for very precise control of the radiation dose delivery in the patient. For instance, IMRT allows for delivery of large tumor doses but minimal normal tissue doses to tumors that are directly adjacent to a normal organ or even partially wrapped around a normal organ. IMRT is commonly used for nasal tumors and tumors within the chest, abdomen, or pelvis. The downside of IMRT is that both treatment planning and treatment deliver take longer than 3D-CRT. Volume Modulated Arc Therapy (VMAT or RapidArc) is a newer type of IMRT also available at Tufts. The concept behind RapidArc therapy is very similar to IMRT, except that the linear accelerator has the capability to rotate 360 degrees around the patient while simultaneously delivering the radiation, increasing the number of angles used. As with IMRT, treatment planning for RapidArc is both time-consuming and complex but daily treatment delivery is more rapid. Stereotactic Radiosurgery (SRS) or Stereotactic Radiation Therapy (SRT) involves delivery of a very high fractional doses of very conformal radiation in 1 to 5 daily or every-other-day treatments. The dose is high enough to ablate the tumor in the treated area with great precision, much like what is achieved through surgery (hence the name). Thus, although only a few treatments are used, this type of radiation therapy is often considered to have a definitive treatment intent. Daily advanced imaging, patient fixation devices, sophisticated treatment planning software, an appropriate linear accelerator and strict quality assurances are required for SRS and SRT. SRS and SRT are still relatively new treatment options in veterinary oncology, thus long-term outcome data is relatively limited and the margin of safety for treatment complications is very narrow. The primary benefits of SRS and SRT include the convenience of the treatment schedule and the potential for a patient to avail the benefits from radiation therapy as quickly as possible. What will the Daily Treatments Entail? In order to accurately and precisely target the tumor, radiation therapy requires that the animal be perfectly still during treatment. Thus, a light plane of brief general anesthesia is necessary for each treatment. There is always a slight risk associated with general anesthesia, but nearly all cancer patients withstand this portion of the treatment very well. The anesthesia is closely monitored by the attending veterinarian and an experienced nurse anesthetist. Tufts also has multiple board-certified anesthesiologists on staff for consults and support. 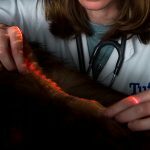 Careful evaluation and diagnostic testing prior to the start of radiation will help to identify any underlying health problems in your pet prior to anesthesia. We also typically run repeat full bloodwork on your pet approximately half way through a full course of radiation therapy to reassess the overall health of your pet as they are going through therapy. Once your pet has started radiation therapy, it is important that they do not miss any of their scheduled treatments. Please let us know as soon as possible if you have any conflicts in scheduling. Your pet will need to be fasted every night prior to radiation therapy. It is important that he or she is not fed after 10 pm the night before each treatment. Your pet may have access to water at all times and may receive any morning medications. In general, we recommend that your pet continue with their normal daily activities, but certain restrictions may be necessary depending on the tumor type and location. It is important that your pet not swim or that you do not bathe your pet during radiation therapy as the marks for the radiation treatment field setup will be washed off. It may also be important to limit sun exposure during and after radiation therapy. Some hair within the radiation field may be clipped and the skin will be exposed and more susceptible to sunburn. Both normal cells and cancer cells are affected by radiation therapy, but the treatment is designed to maximize damage to tumor cells while minimizing effects to the surrounding normal tissues. First, the radiation is administered over a series of treatments rather than a single treatment to allow the normal tissues to recover between treatments. Also, radiation therapy limits the damage to normal tissue because it is targeted to the precise area in which the tumor is located. Each animal has their own individual sensitivity to radiation therapy, but given the recommended treatment protocol and tumor location, the radiation oncologist will advise you on the specific side effects your pet may develop at your consultation appointment. Generally speaking, acute radiation side effects typically start to develop near the end of a treatment course and continue to progress for the first 7-10 days after the end of therapy and then subside. Depending on the area treated with radiation therapy, these side effects may include: hair loss (usually grows back over several months), variable changes in the skin (from mild redness to very red, moist and sore skin), inflammation and possible ulceration of mucous membranes in the mouth, eyes, or gastrointestinal and genitourinary tracts, and possible soft stools or diarrhea with pelvic irradiation. It is important to remember that side effects only occur locally within the radiation treatment field. Your pet should not be systemically sick from his or her therapy. We will carefully monitor any side effects your pet may develop and have you monitor him or her at home. We have many options for treating these side effects including pain medications, local nerve blocks, antibiotics, anti-inflammatory medications, and topical creams to keep your pet comfortable. It is important that your pet not lick, chew, or scratch at the affected areas. We may therefore recommend that you pet wear an Elizabethan collar (e-collar) and/or bandage where feasible to keep your pet from further self-traumatizing the site. It is also possible for your pet to develop side effects months to years after the end of a course of radiation therapy. These delayed side effects are referred to as late side effects. Late side effects are generally much less common than acute side effects but tend to be more problematic. Cataracts or dry eye can be a late side effect to the eye if within the radiation field. There is also a small risk organ stricture, scar tissue, tissue necrosis (death), or secondary tumor induction with radiation therapy. We will discuss these risks at your consultation. What Happens After Radiation Therapy? It is important for us or your referring veterinarian to examine your pet periodically after radiation therapy is completed. Monitoring will initially be more frequent if your pet is experiencing any acute side effects. Long term recheck examinations are then important as they will allow late tissue side effects to be detected before they become advanced and the effect of the radiation on the tumor to be evaluated. In some pets, a tumor may be completely eradicated by radiation therapy and no evidence of the tumor persists. In other pets, the cancer or lump may never completely disappear, but growth is slowed or stopped and the tumor is essentially controlled for a period of time. The specific results to be expected depend on many factors. The oncologist will provide specific details on the likelihood of success as part of the evaluation process. 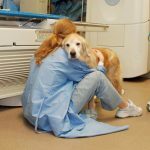 Finally, it is important to realize that even though your pet may never be totally the same as before the cancer was diagnosed, it is possible to provide him/her many additional comfortable months or years of happy life through radiation therapy. Treatment of cancer with radiation can be costly. It involves very complex equipment as well as the expertise of many health care professionals. The exact cost of radiation therapy varies with the type and number of treatments required. Pending the tumor site and location, a CT scan or radiographs may also be required to plan the radiation therapy. We will provide you with a cost estimate at initial consultation. This group offers support to caregivers through each stage of their pet’s cancer journey. Facilitated by our licensed social worker, this group can help you cope with the emotional and practical challenges that arise when your pet has cancer. This is an open-ended group that provides mutual support in a safe and non-judgmental setting. 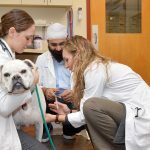 Cummings Veterinary Medical Center’s clinical social worker, Eric Richman, MSW, LICSW, will be leading a free monthly gathering on the first Wednesday of each month from 9:30 – 10:30 a.m. No registration is necessary. Call our social worker with questions at 508-887-4371.